………..The Dazzle Me slot was released on the 24th August 2015, and is a stunning video slot with 5 reels and a industry first 76 bet lines. 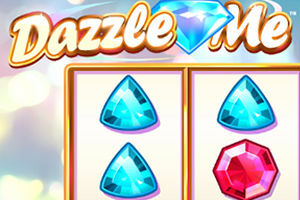 The game features Dazzling Wild Reels, Free Spins and Linked Reels. Dazzle Me keeps the tentions high as Dazzling Wild Reels randomly appear during the main game, while Free Spins features the instant-classic Linked Reels to add even more excitement to this sparkling video slot! The maximum win on a single spin within the main game is 4,000 Euros on Dazzle Me and the maximum win from free spins is also 1,000 Euros and it is possible to win 304,000 Euros on a coinciding win. The minimum bet per spin is 0.2 Euros and the maximum is 400 Euros! The Linked Reels feature makes a welcome comeback, appearing at the beginning of each spin within the Free Spins! You can play the Dazzle Me slot at any of the recommended sites below, all of which have this new game! 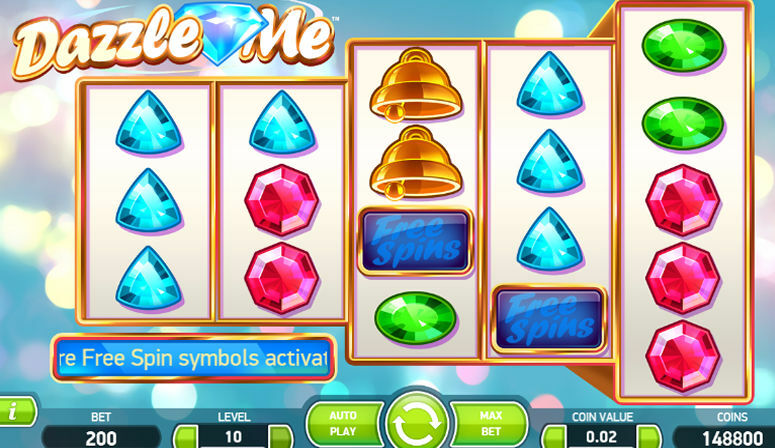 FREE SPIN OFFERS – Exclusive Dazzle Me offer! *Promotion is available until 2nd September 2015, 23:59 CET. Country Restrictions may apply.